(CNN) -- The number of confirmed cases of the H1N1 virus has jumped nearly 30 percent with 331 people being infected so far, the World Health Organization said Friday. 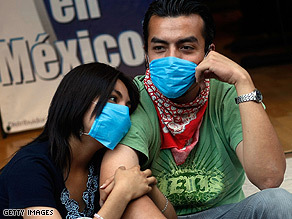 A young couple in Mexico City wear surgical masks in an attempt to avoid contamination from the virus. The WHO added that the virus had spread to 11 countries, but the hardest hit areas were in the western hemisphere. "We have not seen sustained human to human transmission anywhere outside the Americas region," said WHO spokesman Thomas Abraham. Two more countries, Denmark and China, reported cases of the 2009 H1N1 "swine flu" virus on Friday, but they were still to be confirmed by the WHO. The largest outbreak was in Mexico which had 156 confirmed cases, while there were 141 cases confirmed and one death in the United States, according to the Centers for Disease Control and Prevention (CDC). The WHO said Mexico had 9 deaths attributed to the virus. But Mexican officials said the death toll had risen to 12. However, more than 150 deaths in Mexico are suspected to have been caused by the virus and are being investigated, officials there said. The higher totals do not necessarily mean that incidence of the disease is increasing, but rather that health investigators are going through their backlog of specimens, said Dr. Keiji Fukuda, assistant director-general of WHO. An additional 642 cases are being investigated in the United Kingdom, and Spain has 84 suspected cases. Australia, which has had no confirmed cases, was investigating 114.